One month ago, Goldman provoked gasps from Wall Street when its buyback desk increased its estimate of 2018 stock buyback authorizations to a record $1.0 trillion, a 46% rise from last year. There are two reasons for this surge: the first is tax reform which allowed companies to repatriate offshore cash at staggering amounts, which was then used to repurchase corporate stock. Additionally, surging corporate profitability has also led been a key driver behind the jump in share repurchases. According to Goldman, S&P 500 revenues rose by 11% during 1H Y/Y. At the same time, EPS climbed by 25% during the first half as firms benefited from lower corporate tax rates. As a result, S&P 500 cash flow from operations (CFO) surged by 35% to $917 billion in 1H 2018. 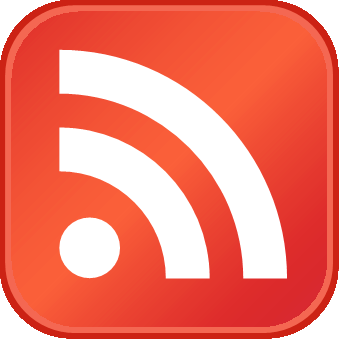 And according to the latest Weekly Kickstart from Goldman's chief equity strategist, David Kostin, "this rise in CFO created a high-quality problem for managements: How should they spend all the cash?" The answer Donald Trump (and Gary Cohn during his brief tenure in the White House) was hoping for, obviously, was spending on growth and CapEx, which would result in more hiring and generally even higher GDP growth. 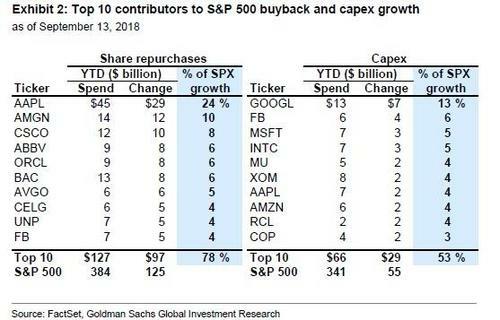 However, something else happened: according to Goldman, for the first time in 10 years, buybacks will be the biggest use of cash by S&P 500 firms. This is notable because spending on CapEx has typically represented the largest single use of cash by corporations, "a position it has held for 19 of the past 20 years." But not in 2018, in which buybacks have increased by 48% to $384 billion during 1H 2018 vs. $259 billion in 1H 2017. 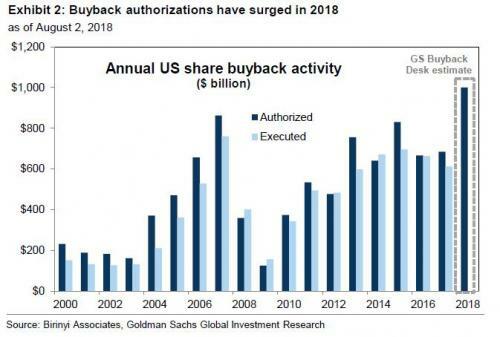 Furthermore, 2018 share repurchase authorizations for all US companies have totaled $762 billion through mid-September, and is the reason why when annualizing the number, Goldman now comes up with over $1 trillion in total buybacks for the entire year. Which is not to say that companies aren't spending on capital: during the first half, S&P capex rose by $55 billion to $341 billion vs. $286 billion in 1H 2017 (+19%). If this pace persists, it would represent the fastest growth in capex in at least 25 years. Still, with $384 billion spent on buybacks vs $341 billion spent on capex, this is the first time in a decade in which companies will spend more on shrinking their share float than investing in the future. 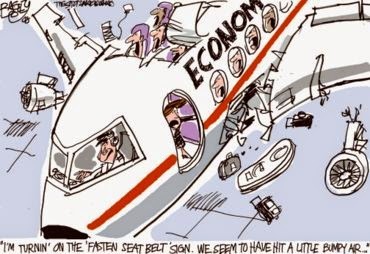 Meanwhile, Research and Development spending also rose by $18 billion during 1H to $147 billion (+14%), the highest rate of increase in more than a decade. R&D spending has increased by 6%-10% annually during each of the past 8 years. First, capex growth has been more broad-based than buyback growth. Capex growth for the median S&P 500 firm was 11% during 1H compared with 19% growth in aggregate capex. In contrast, repurchases by the median company grew at just one-fourth the pace of the aggregate index during 1H (13% vs. 48%). Second, buybacks - like the S&P leadership itself - have been closely concentrated, as the 10 companies with the largest dollar increases in capex boosted spending by 79% and accounted for 53% of the aggregate rise in S&P 500 capex ($29 billion of $55 billion). The $7 billion rise in GOOGL capex during 1H (to $13 billion) accounted for 13% of the aggregate rise in S&P 500 capex. FB, MSFT, INTC, and MU round out the top 5 stocks contributing to capex growth (21% of overall growth). Putting this capex concentration another way, the 10 stocks with the largest dollar increases in repurchases accounted for 78% of aggregate growth in S&P 500 buybacks during 1H ($97 billion of $125 billion), and not surprisingly, AAPL dominates, accounting for a staggering 24% of overall growth in S&P 500 buybacks during 1H, according to Goldman. The firm spent $45 billion buying its shares during 1H, roughly 3x the $16 billion in repurchases completed during 1H 2017. AMGN, CSCO, ABBV, ORCL round out the top five stocks contributing to buyback growth (31% of overall total; see Exhibit 2). 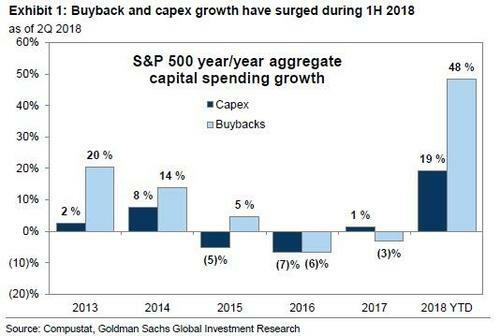 And here a notable tangent: despite media reports that the market has been punishing companies that invest in buybacks and rewarding those that spend on capex and R&D growth, Goldman's data finds the opposite. 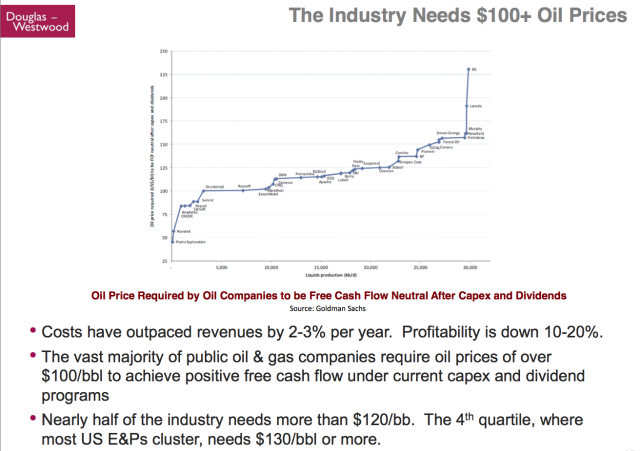 In fact, according to Kostin, "broad-based capex growth is one reason why stocks investing the most in capex and R&D have lagged YTD while firms prioritizing buybacks have matched the market." Our sector-neutral basket of 50 S&P 500 stocks with the highest combined trailing 12-month capex and R&D yields has lagged S&P 500 by 4 pp YTD (6% vs. 10%). 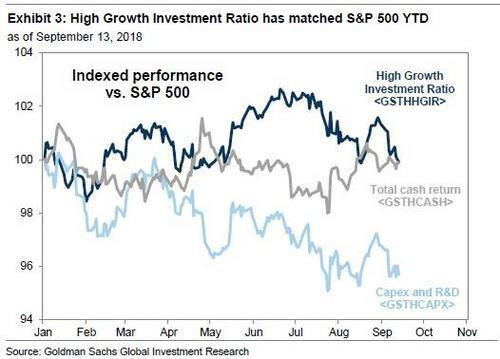 Said otherwise, amid the deluge in capex spending, investors have become confused who to focus on, or as Goldman puts it, "a broad-based rise in capex has reduced the scarcity premium that investors are willing to pay for firms investing for future growth." Oddly, they have no such problems when rewarding companies that repurchase their own stock. Said differently, for all the debate about whether buybacks are good or bad for the market or the economy - as they take away from other forms of cash use - investors are quite clear who to reward, and here expectations of cash return to shareholders is by far the clear winner over companies which spend on future growth. That said, in the near-term buyback support for the market may be on hiatus. The reason: the buyback blackout period has begun and "presents a near-term risk" as companies are precluded from making discretionary share repurchases during the month before reporting results. While only 18% of the index is currently in blackout, this number will rise to 86% by October 5. But don't assume that this automatically means lower stock prices: since 2000, S&P 500 returns have been comparable in blackout and non-blackout periods. What has changed, however, is realized volatility which has been nearly 1 point higher in blackout periods than when a majority of firms are free to repurchase stock (14.4 vs. 13.6). In other words, while stocks may not necessarily suffer due to the arrival of the blackout period, volatility will likely rise.